Barley grass and wheatgrass have been introduced to American consumers by boutique beverage companies. These grasses are nutrient dense, which is why they are popularly sold by companies catering to the health-conscious masses. Both barley grass and wheatgrass have bright green colors, which may be the reason for their appeal. Fresh barley and wheat grass have added benefits over dried versions, because they still contain the enzymes that get lost in the drying process. Set up two containers -- one under each of the two spouts of the juicer -- one to collect the juice and the other to collect the pulp. The spout directly in front of you will churn out dried grass, while the spout underneath will yield pure grass juice. If you need to measure how much grass you're juicing, it helps to place a calibrated container underneath the spout that will yield the juice. Place the fresh wheatgrass or barley grass inside the receptacle in your grass juicer. Don't put your hand inside of the receptacle, for safety purposes. Instead, use the plastic pusher to push down the wheat grass into the receptacle. You can use the pusher that came with the juicer to ease the grass into the grinder, making for a faster juicing process. Switch the grass juicer on, or crank the handle multiple times if you have a manual juicer. The juicer will extract the juice out of the grass, separating the pulp from the juice. Add more wheatgrass or barley grass as necessary. Make sure to keep an eye on your juice container to avoid overflowing. Pour out the wheatgrass or barley grass juice from the original container into shot glasses. It depends on individual preference if you want to drink the foam along with the juice. If you want to drink the juice only without the foam, pouring the juice slowly will retain the foam in the original container, and the resulting foam-free juice will be transferred into the shot glass. Store the rest of the juice in the refrigerator. You may also freeze wheatgrass or barley grass juice to maintain its freshness, and defrost as needed. 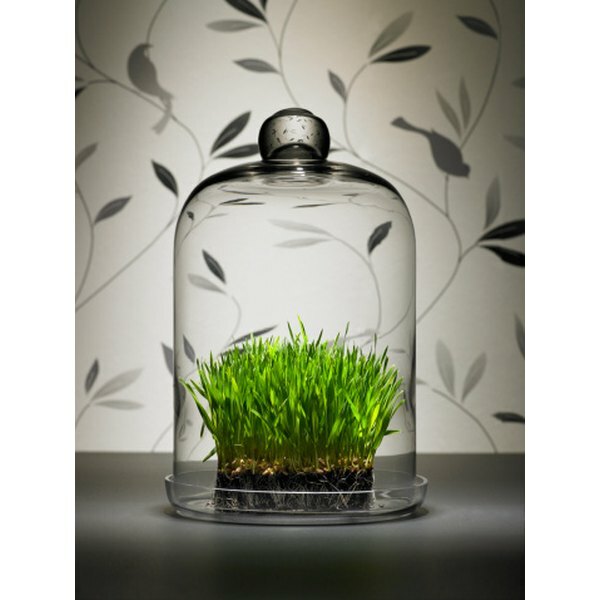 You can get fresh wheatgrass and barley grass trays from companies such as the Pennsylvania-based Wheatgrass Grower, or grow your own grass using kits from companies such as Wheatgrasskits.com.